The contrasts found in different parts of India are startling and the experiences to be had from north to south and east to west could not be any more different. Timing your trip to India to experience any number of the colourful and vibrant religious festivals that take place will give you a wonderful snapshot into the many religions such as Hinduism, Sikhism, Buddhism and Islam. 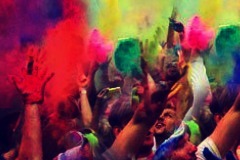 There will be no chance to just stand back as you will no doubt with swept up by the exuberance displayed by revelers. There is no sweeter sound in India than hearing the chai-wallah shout ‘chai, chai, chai’ when on the street or on the train. For a mere 10 rupee, it’s not surprising to see locals drinking sweet milky tea everywhere and at any time of the day. 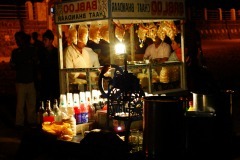 A ritual for many, drinking chai forms the basis of catching up with friends and family, conducting business or finalizing an agreement of price for a purchase. 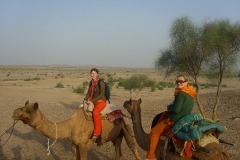 Venture out into the vast sandy Thar Desert in Rajasthan. Setting out from Jaisalmer or Pushkar, enjoy a camel ride out through nomadic villages, eat authentic local cuisine over an open fire, be treated to a local cultural performance and watch an incredible sunset casting golden hues over the immense sandy landscape. It will be a life defining moment. Throw any ideas of a diet out the window and eat your way around India. The array of mouth-watering cuisine on offer is endless and local delicacies are set apart by varying uses of spices and other ingredients. No country does vegetarian food better than India although meat eaters are also catered for. It’s a curry lover’s paradise but don’t forget to also try an Indian breakfast, thalis, lassis and Indian sweets. You will never go hungry in India! 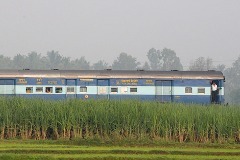 Many say that if you haven’t ridden a train, then you haven’t experienced true India! The comprehensive rail network carries 25 million passengers every day and is the preferred travel option for many people traversing the country. It’s cheap, safe and a relaxing way to see the spectacular and changing landscape. Inner city trains can be particularly chaotic and aren’t for the faint hearted but can offer a fascinating insight into local life in heavily populated areas. Everywhere you go in India you will hear calls of ‘auto, auto’ and ‘rickshaw rickshaw’ so jump in and go for a hair raising drive through a city. If you’re lucky, and up for it, you might be allowed to take one for a spin yourself. Some are decked out with flashing neon lights and pumping Bollywood music making it a little disco on wheels. Taking time to learn a few key Hindi phrases while in India will generate smiles and nods of encouragement everywhere you go. It might even get you a discount when haggling for goods! Colourful and noisy markets are a bountiful place to grab bargains and buy some terrific and authentic souvenirs to remember your trip by. From textiles to artwork and jewellery to carvings, you will want to make sure you have ample room in your suitcase to take home all of your purchases! India is the home of yoga and with plenty of styles and classes to choose from, there is no other place in the world better to start as a beginner or hone your skills through advanced classes or teacher training. 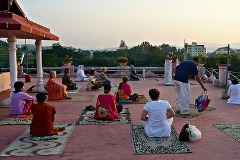 Rishikesh is the favourite hotspot for people to come and learn. India’s beaches along the Goan coastline are a place of seclusion and relaxation. Quiet in the south and parties in the north, it will feel like a world away from the ‘real’ India when you are lying on the beach working on your tan.